When Ben is tempting his cat across the page with a fluffy mouse, his cat . . . disappears! Then his best friend Bella disappears, too. Sniffer dogs and rescue teams can't help . . . When Ben also vanishes, it's up to the reader to sort the situation in this playful and funny sto... read full description below. 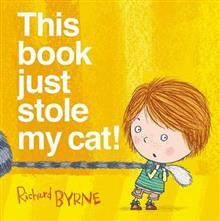 From award-winning Richard Byrne, author and illustrator of This Book Just Ate My Dog, (shortlisted for the Children's Book Award) comes another brilliantly inventive book starring Ben and Bella. When Ben is tempting his cat across the page with a fluffy mouse, his cat . . . disappears! Then his best friend Bella disappears, too. Sniffer dogs and rescue teams can't help . . . When Ben also vanishes, there's only one person left to help. You, the reader! Can you release Ben, Bella, and the cat from the mischievous book? It's a ticklish problem. Original, simple, and witty, this high-concept picture book plays with the physical attributes of a book to create a real page-turner. Always arty as a child, at the age of 10 Richard won a competition to design a poster for the Sussex Police and won GBP10. That was when he realized he could make a career out of drawing. After studying at Eastbourne College of Art and Design, Richard set up his own graphic design business. Richard currently lives in Chichester with his partner Philippa, their two children, and two guinea pigs.